A martyr is a witness. He is a person who chooses death rather than deny his faith. As the end of the world approaches, this murder of representatives of Christ will only intensify. (Matthew 10:21-22a) Jesus Himself spoke of the dynamic when He said, "'[B]ut an hour is coming for everyone who kills you to think that he is offering service to God.'" (John 16:2) It's how they treated Him. (Matthew 10:25) It's how the twelve apostles were treated. 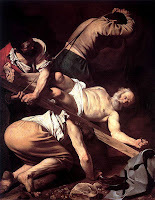 According to tradition, Peter was crucified upside down. (John 21:18-19) James was killed with a sword (beheaded). (Acts 12:2) John was boiled in oil, but survived. Andrew was crucified on an X-shaped cross. Philip suffered crucifixion. Bartholomew (Nathanael) was flayed alive with knives. Matthew was killed with a sword in Ethiopia. Thomas was speared to death in India. James (the Less) had his brains smashed out in Syria. History is largely silent about Thaddaeus, Simon the Zealot and Matthias (the replacement for Judas), but it's safe to assume they gave their lives for the cause of Christ, too. Before the first apostle (James) was martyred, there came Stephen. (Acts 7:58-60) As Stephen was being stoned to death, a young man named Saul stood by applauding the event. (Acts 22:20) This same Saul would later convert and become Paul, who would write, "'For Thy sake we are being put to death all day long; We were considered as sheep to be slaughtered.'" (Romans 8:36) He was quoting Psalm 44:22 to a church that was about to undergo tremendous suffering. The psalmist couldn't understand why Israel had been defeated despite her faithfulness to God. The truth is Israel was suffering because of her faithfulness to God. Success is only for people who keep the spirit in spite of obstacles and barriers in front of the eye. شركتنا تقدم خدمة التنظيف في كافة المجالات ونواحي الحياة حيث تقدم خدمة تنظيف المنازل والفلل بكل محتوياتها من سجاد وموكيت وحمامات ومطابخ وايضا تنظيف المفروشات والستائر شركة تنظيف بالخبربتنظيف المسابح والخزانات والواجهات الخارجية وتنظيف الشركات والمساجد والمؤسسات الكبري بخصومات هائلة وعن طريق افضل مواد تنظيف واحدث اجهزة تنظيف وهي الاجهزة البخارية التي أثبتت فاعلية كبرى في مجال التنظيف واستطاعتها ازالة اصعب البقع والاتساخات بكل سهولة ويسر حيث هذه الاجهزة هي انسب طريقة من اجل تنظيف الستائر والسجاد والكتب فهي لاتضرهم اطلاقا ولا تؤثر على ألوانهم بل تنظيفها جيدا ويعودون كما لو كانوا جداد، كل هذا وتكون التكاليف غير باهظة فشركتنا تقدم افضل الاسعار.